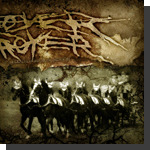 Destroyer Destroyer is a Techgrind band from Oklahoma City. They are notoriously different from their other grindcore counterparts, opting to shy away from spazz noise riffs and instead having highly detuned tech songs (with the help of 7 string guitars) backed with odd time signatures and polyrhythms. DD released their first ep "The Spiderbear Tales" as a split with grindcore band Vessels Cast From Crippled Hands and were then signed to Debello. Soon after, they released the ep "The Dead Sleep Like Us For A Reason" which was bought with much acclaim in the underground scene. Recently, Destroyer Destroyer has left Debello in favor of a three album contract with Goodfellow Records, where they plan to tour with fellow labelmates The Handshake Murders. Destroyer Destroyer has currently completed their newest album, "Littered With Arrows", and plan to release it on October 17, 2007.